indianaquariumhobbyist.com » Forums » DIY » Built a 4 channel Timmer; Is anyone interested in a guide? http://indianaquariumhobbyist.com/community/ :: View topic - Built a 4 channel Timmer; Is anyone interested in a guide? Built a 4 channel Timmer; Is anyone interested in a guide? Posted: Sun Jun 24, 2018 5:54 pm Post subject: Built a 4 channel Timmer; Is anyone interested in a guide? I've made a 4 channel timer for my 7G nano. The timer turns the lights on at 8am, then turns them off at 12, again turning them on at 4 and turning them off at 8pm. It also turns on a 3W LED ambient light on at 4pm and turns it off at 9pm. Its got a screen on it that also acts as a digital clock, and it monitors the room temperature as well. Most commonly available timers only feature one channel and are highly unintuitive if you wish to set anything more than a simple morning on and evening off schedule. And still cost anywhere from 700INR to 1600INR. My module has 4 channels, is rated at 10A, has a bright screen to display time and even tells ambient temperature. All this, while costing less than 2000, including every single thing that I needed. To me it costed much less, since I had all the components already with me from previous projects. I would love write a tutorial for it, if anyone is interested. It requires no soldering, school level electronics knowledge and ability to handle a computer, thats all. 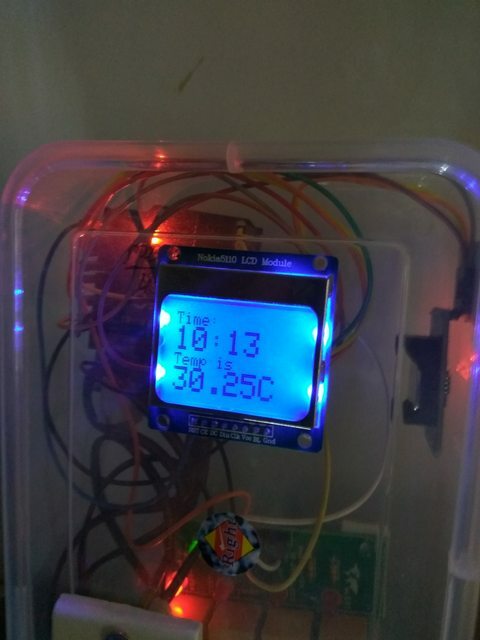 This has been running on my nano since a few weeks, but one of the modules inside the unit was inadequate and hence the timer used drift in time, however that has been sorted now and hence Im writin this post. Please do post a tutorial. It will definitely help IAH community. Yes sir, along with details of where you got the components from, and the relevant pricing. Please do post a tutorial. It will definitely help IAH &nbsp;community. Thanx for showing interest in the project! Im not very good at writing tutorials, and I'm lazy AF too, so I'll start by merely listing the components and the cost and a brief description of the item. The detail Tutorial will be posted once I'm done writing it. Description: Will be used for interconnection, listing has much more than what you'll need for the project but they are handy otherwise. No Soldering required anywhere thanx to these. Description: Will be used to turn our lights ON or OFF. Description: Optional component if you wish to see the ambient temperature, Time or anything else. Personally I find projects with their own display utterly cool! Description: Used to maintain time in the project. It also has an onboard temperature sensor which we can use if needed. COST: Should be around 50-100 depending upon size you choose. [ii] Electric Wires: We need about 5ft max. Any gauge will work. [iii] Wall Sockets: Max 4, minimum 1, depends how many sockets you want. This is the first post in a series, in the next post I'll map how to connect all the devices together. Take care guys! Nice build Eagerly waiting for more!! 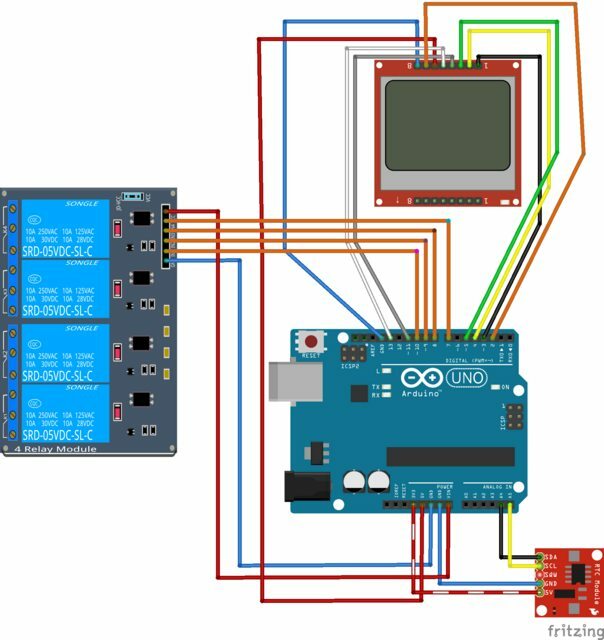 Here is schematic on how all the components connect to each other. Wiring the Relays is a bit tricky to explain graphically. I'll explain in short how we're looking at controlling the devices. A relay is basically an ON/OFF switch that can be triggered electronically. So when the relay is ON, there is circuit being made and when its off the circuit is broken. We incorporate it into our project by connecting the one wire coming from AC mains to one point of the socket and the other wire from the main goes in the C1 port of the relay. We will then attach another wire to the C2 port of the relay which will connect to the other point of the socket. When the relay is On, there is a connection between C1 and C2 and the Socket will be "ON" when the relay is OFF, the connection is broken and the Socket is OFF. I hope I've been clear with the instructions so far, I'll explain the programming part in the next tutorial. You can shoot a question if you have any doubt. Take Care! Good one Ashwin... Will you be sharing the code too??? Good to see you after a very long time!